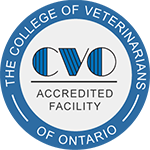 Manning Equine Veterinary Services offers both ambulatory care and on site facilities and is situated on 100 picturesque acres in Erin Township, central to Guelph, Caledon, Orangeville and Georgetown. We regularly travel to various parts of Ontario to provide specialty services to our clients and Dr. Manning has traveled internationally to provide assistance to our clients purchasing horses out of province or overseas. Our clinic is compromised of 13 clinic stalls, 5 broodmare foaling stalls, 2 treatment stalls and 1 surgical stall (non inhalant), as well as an in house laboratory. We also offer a variety of turnout options such as individual grass paddocks, round pens for restricted turnout and lush grass pastures equipped with large run-in sheds. Our facilities include a large indoor arena with European waxed footing, a large sand ring with natural sand footing and a grass jumping ring. A CFIA approved quarantine barn features its own turnout paddocks to allow your horse turnout during its time in quarantine. Visit our gallery for a tour!